Based on the classic amp that helped launch Cyrus with aptX Bluetooth, phono stage for turntables and a headphone amp. 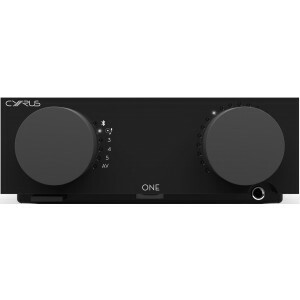 Cyrus One HD with DAC version also available. Cyrus One is designed in a clean, simple, elegant non-ferrous chassis designed to minimizes eddy currents and reduce pickup of external noise. Extensive mains supply filtering is used to reduce the impact of external noise which has the ability to colour the audio performance. 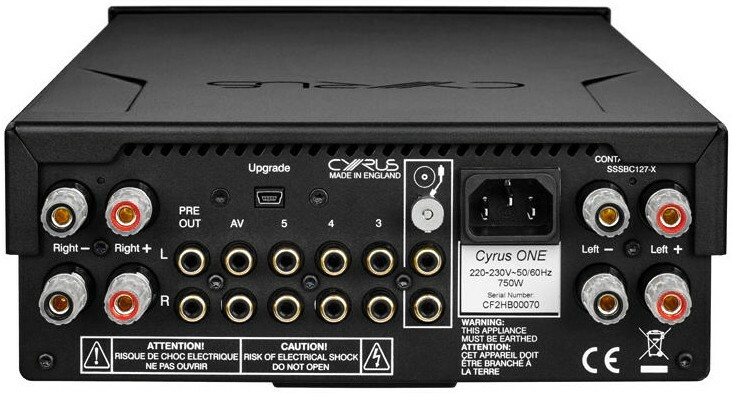 Featuring Cyrus’s own 3rd generation Class D amplifier providing 2 x 100W of power, aptX compatible Bluetooth connection, a dedicated high power , high voltage class AB headphone amplifier, MM Phono stage, and 4 line level inputs this is a high performance solution that will form the heart of many different lifestyle systems. The infra-red remote can control volume and switch inputs, as well as adjusting the brightness of the display LEDs to suit your listening environment. AptX compatible Bluetooth enables you to stream music from your phone/tablet or computer via a wireless Bluetooth connection, providing maximum flexibility without the need for a home network or any complicated setup. This allows everyone in the family to enjoy their music from their portable devices quickly and easily.